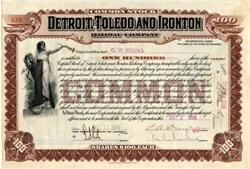 Beautiful uncancelled certificate from the Detroit , Toledo and Ironton Railway Company issued in 1906. This historic document was printed by the International Banknote Company and has an ornate border around it with a vignette of an allegorical woman holding a wreath. This item has the signatures of the Company’s officers, and is over 105 years old. The Detroit, Toledo and Ironton Railway was organized in 1905 through the merger of the Detroit and Lima Northern Railway and the Ohio Southern Railway. The line went bankrupt in 1908, but remained solvent until it was purchased by Henry Ford in 1920. Ford recognized the strategic importance of the line to his automobile business as the line left Dearborn, Michigan and connected with all of the major east-west rail lines in the Midwest. This gave Ford direct control over shipments of raw materials and finished goods to and from his factories in Dearborn. The line thrived and saw numerous improvements under Ford's management. However, Ford sold the line in 1929 to the Pennsylvania Railroad after becoming disgusted with interference and over regulation from the Interstate Commerce Commission.